Gas is an efficient way to heat your greenhouse. A greenhouse gas heater can help protect your delicate plants when the weather gets really cold and make things more pleasant for you when you're working in the greenhouse in the cooler months. Space heaters: Conventional space heaters like you might use in your house are an economical way to heat a small greenhouse, and they can easily be removed in warmer months. Electric overhead heaters: Installed in the ceiling, these heaters help distribute warm air evenly through the greenhouse. Ceramic heaters: Another electric option is a ceramic heater, which is a powerful and efficient choice for a greenhouse. Forced-air systems: Similar to the furnace in your home, a forced-air system can be used in a greenhouse as well. Steam or hot-water heater: Water is heated (often using coal or natural gas) and the steam produces heat to warm the greenhouse. Gas heaters: Greenhouse gas heaters, whether using propane or natural gas, do not require electricity, meaning your plants will be safe during power outages, and the heater circulates heat, providing an evenly warm temperature throughout the greenhouse. 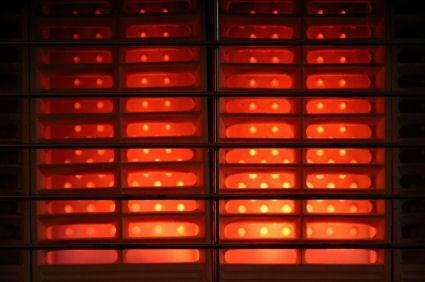 Within the category of gas heaters, there are also vented and non-vented heaters. Non-vented heaters have an open flame and do not need to be vented to the outside, while vented heaters have an enclosed flame that needs to have a vent to the outside and access to fresh air in order to run. Before you buy a greenhouse gas heater, you need to know what kind you want and how many you might need. Experts suggest that people in cold climates like in the northern United States should have one heater for every 150 to 175 square feet of greenhouse, while people in warmer states can do with one for every 200 square feet. People in the south can heat as much as 225 square feet with one unit. Once you've figured out the logistics of what kind of heater you want, how many you need and how to accomplish any venting that is required, it's time to go shopping. However, unless you have a local store that specializes in greenhouses, it's unlikely that you're going to find what you need locally. A greenhouse heater (or two) is a big purchase to have shipped to your home (meaning expensive shipping costs), but if this is the only option available to you, it's something you're going to have to do. You could also check with a local garden supply company and see if any of their vendors sell greenhouse heaters. While the shop might not carry greenhouse supplies, they might be able to expedite an order for you and have it delivered to their store. Make sure that if you are installing your greenhouse heater or heaters yourself, that you are completely confident of what you are doing. Read and follow all of the instructions carefully. Improperly ventilating your greenhouse heater can cause an explosion, which certainly takes the fun out of gardening. If you don't feel the installation is something you can do, seek out a local heating installation company, which should be able to help you with the installation. Choosing the right greenhouse heater is vital to the happiness and long life of your plants, particularly if you live in an area that gets really cold in the winter. Plan ahead for cold weather and get your heaters installed before the weather turns if you can-you and your plants will be glad you did!